She decided to shut up, which Morgan took as a victory, but still she had a sense, from the fishy glint of his glare, that she should have shut up sooner. People with secrets shouldn't make enemies, she warned herself. We are the beginning, he heard inside his head, and it felt like prayer. We always have been. This time, let it be more than a beginning. This was something special even for her résumé of disaster, which had grown pretty fantastical over the past few months. It`s a good thing there are only two worlds for me to worry about destroying, she thought. Except that, oh hell, there probably were more. "You wouldn't want to sleep through this, love. These are extraordinary times." Her smile was beatific until it turned mischievous. "Or they will be, once you figure out how to make them so." War does that, nothing for it. Reality lays seige. Your framed portrait of life is smashed, and a new one thrust upon you. It's ugly, and you don't even want to look at it let alone hang it on the wall, but you have no choice, once you know. Once you really know. Laini Tayor captured many with her stunning debut Daughter of Smoke and Bone, then continued to steal our hearts with Days of Blood and Starlight. 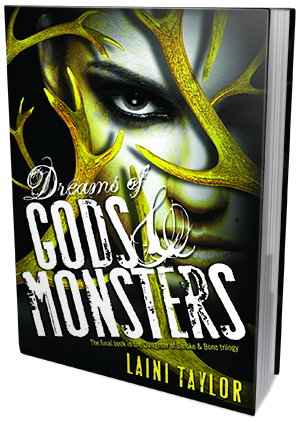 Dreams of Gods and Monsters was a masterfully written and stunning conclusion to this trilogy. Taylor's writing is like a finely crafted piece of jewellery that everyone desires and admires and will only ever want to see more of. After all is said and done, there is no other way to describe this series but a work of art. Dreams of Gods and Monsters is far from a small book, and yet the story keeps at such a pace that you just can't put it down. When you do it is either because you have to, or because you have finished it and are ready to sit and digest the magnificent book still resting in your hands. What still rests with me is just how perfectly these books played out. The end of this book seemed like it was exactly how it should have been, how realistically and practical it all was. Everything that happened in any of the three books (no matter how tragic) was important, even the smaller of details. Turns out this story was always more than a war over one world. The most stand out element for me in all of these books was, the characters. Taylor crafted characters that you could really get in to and route for. Even in this final instalment the characters that were newly given points of view, felt natural. This speaks volumes for the talent that oozes out of this author, as I normally find last book additions end up irritating me more than attracting me. However, from start to finish the characters in this series pulled at most of my emotions. Karou and Akiva, the pillars of this story, were everything I could have wanted and more. Their story was not a fairy tale but it was right, even when I was screaming at them for their separation. Zuzana, was probably my favourite because of her huge personality and die hard loyalty. These are three of many characters that I will miss with the end of the series and find the time to read because of. The dimension that Dreams of Gods and Monsters gave to the entire trilogy was beyond remarkable. There were so many things that this book brought to the table, some you could never have seen coming and others that you had suspected but could only speculate would come into fruition. In doing this Taylor created a third book that was every bit as wonderful and attention grabbing as the first two. With trilogy's it is rare that you experience a conviction of each being as good as the last, if not better but this trilogy leaves you wondering which book exactly it was that you favoured. If you are a YA lover or new to the YA world this series will surely blow you away, remind you of why you love the YA world and capture your heart.